Montana’s Bob Marshall Wilderness Complex, which includes three wilderness areas – the Great Bear, the Scapegoat, and the Bob Marshall, encompasses over 1.5 million acres. 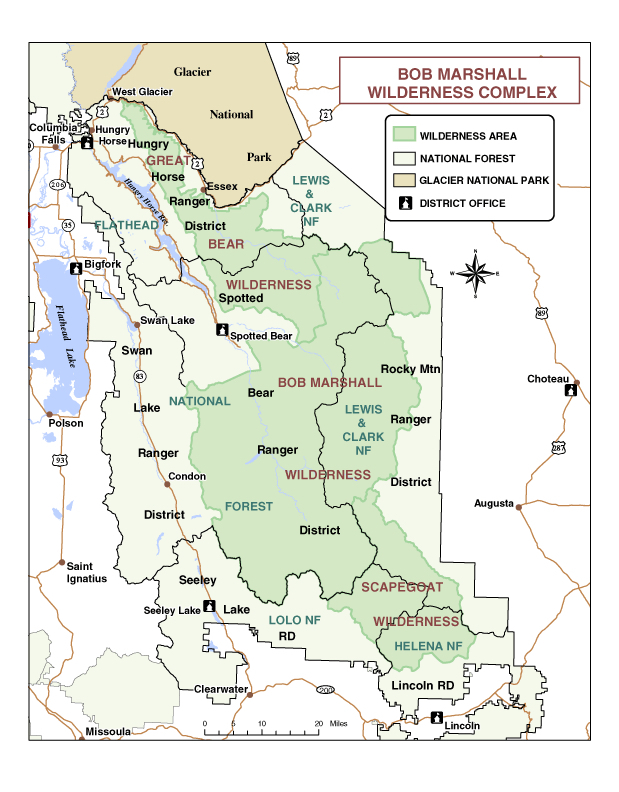 The Bob Marshall Wilderness Complex (the Bob) is the third largest wilderness area in the lower 48. Located in northwest Montana and near Glacier National Park, the Bob is wild and scenic in every way. It’s home to grizzly bears, wolves, elk, moose, mountain lions, lynx, wolverines, deer, mountain goats, bighorn sheep, picas, pine martins, 100’s of species of birds, and a healthy trout population. To name a few. The Bob also includes the famed “Chinese Wall” – a 1,000 feet tall limestone escarpment that extends almost 40 miles. Every summer, we offer multi-day hiking adventures through out the Bob Marshall. The Bob Marshall is the ideal mountain landscape – towering peaks and ranges interspersed with wide river valleys. It includes major mountain ranges – the Sawtooth Range, the Lewis and Clark Range, the Swan Range, and the Flathead Range and several smaller ones like the Trilobite and Pagoda Ranges. The Continental Divide runs the length of the wilderness along the Lewis and Clark Range. Each range is separated by some of the best blue-ribbon trout fishing rivers in the west, including the Sun River and the South Fork of the Flathead River. To the east of the Sawtooth range, the Great Plains unfold from the tow of the Rocky Mountain Front. The “Bob” was named for famed forester, explorer, and conservationist Bob Marshall. Marshall dedicated much of his professional and personal life exploring wild areas and the work he accomplished in developing wilderness management policies helped lay the framework for the 1964 Wilderness Act, which was passed 25 years after his death. The Bob Marshall Wilderness has something for everyone – the hiker, the peak climber, the horseback rider, the wildlife viewer, the hunter, and the angler. We are grateful we get to explore the Bob every summer and show people some of the most beautiful country around. Learn more about our trips into the Bob.